Cyber-Physical Systems (CPS) Solutions for the Future: Early-career investigators collaborate to develop and present research ideas at the intersection of CPS and Smart Cities. Featured image from Tho Nguyen, NSF Cyber-Physical Systems. 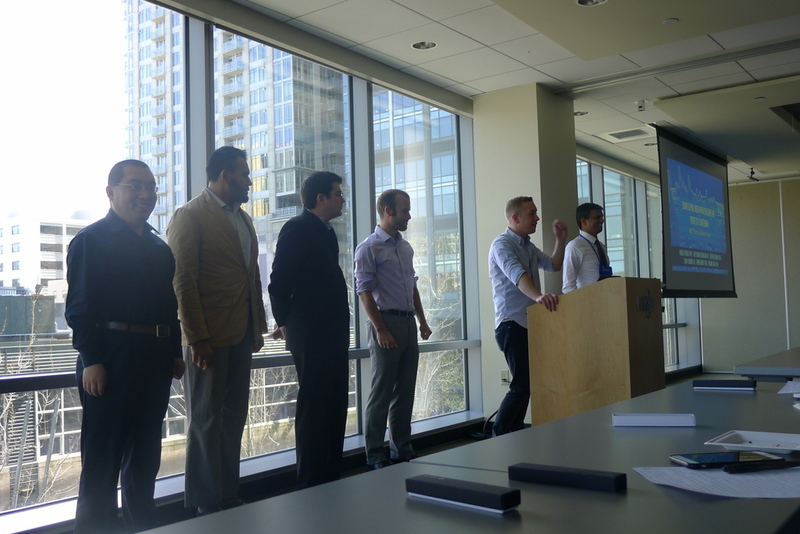 This blog was written by Dustin Richmond (drichmond@eng.ucsd.edu), graduate student at the University of California in San Diego about his experience at the Early Career Investigators Workshop on CPS and Smart Cities workshop held April 13-17, 2015, Seattle. For those who don’t know me, my name is Dustin Richmond and I am a third year graduate student at the University of California in San Diego, studying hardware design and system integration under the guidance of Professor Ryan Kastner. Most of my work is focused on developing tools to integrate Field Programmable Gate Arrays (FPGA’s) into larger systems. My group also develops and deploys FPGA-based technology solutions. Last week, I was fortunate to attend the 2015 NSF Early-Career Investigators’ Workshop on Cyber-Physical Systems in Smart Cities (http://cps-vo.org/group/CPSEarlyCareerInvestigators2015). The goal of this workshop was to “identify, develop, and strengthen the CPS research community” for early-career researchers (such as myself). This workshop was hosted in conjunction with CPS Week (http://www.cpsweek.org). To attend this workshop I submitted a position paper, which was accepted, and presented an academic poster. At the end of the first day of the workshop, myself and other attendees would organize into groups to develop an idea and present it to the other groups. On Monday I picked up my presentation poster from Kinkos, titled: Using Efficient Heterogeneous Systems In Smart Cities. My premise is that off-chip communication is consumes substantially more power than on-chip computation. Therefore, we should do more computation on-chip to avoid off-chip communication. This is especially important for sensors networks, which are often deployed in smart cities and may have limited power available. However, most sensors lack computational resources. so, I proposed that we design sensors using System-on-a-Chip (SoC) chips, where ARM cores and FPGAs occupy the same chip. ARM cores are easy to program, while FPGA’s (in combination with High Level Synthesis languages) provide efficient computational resources. These computational resources can be used to perform reduction tasks like compression, filtering, and even perform encryption more efficiently, reducing power consumption and improving battery life. To be honest, when I arrived at the workshop, I didn’t know what to expect. I knew that what I was proposing was not strictly a “smart cities” application, even though it was part of CPS. Many of the people I met had clear connections to CPS and Smart Cities, while I was proposing an implementation detail. However, as I found out later, my unique perspective was not a problem, it was a huge benefit! Throughout the day on Monday (the main day of the workshop) we heard many talks. About half (or maybe a third) of the workshop attendees gave five minute research talks. In addition to the research talks, we listened to four or five invited speakers who talked about emerging applications in smart cities, sources of funding, and how to apply for grants. All of this was incredibly informative. At the end of the day we were tasked with organizing into groups. Each team would get 10 minutes on Friday to pitch an idea targeting Smart Cities. Feeling a bit out of place I noted which presentations I engaged most with, not the presentations who had the most in common with my work, and approached those presenters to see if we could find common interest. Despite my initial concerns, this actually ended up being the easiest part of CPS week, and the second most fun (aside from brainstorming ideas). By the end of the evening, I had found my group: Charlie Mydlarz (NY University), Ravi Srinivasan (University of Florida), Tamim Sookoor (G2 Inc), Dennis Linders (University of Maryland) and Houbing Song (West Virginia University). On Tuesday, Wednesday and Thursday, we started brainstorming early (while also attending the conference). We quickly settled on using audio (the most common background between us all), but it took us many iterations before we settled on our final idea. One of the great things about our group was the diversity of our backgrounds and skill-sets. The quantity and depth of ideas we generated reflected this. Our project is titled: Soundscaping Urban Infrastructure for Predictive Maintenance. In our project, we propose using audio sensors to diagnose and predict when mechanical appliances will fail. Our rationale is that any mechanical appliance with moving parts will have a unique sound or vibration associated with it, and when it begins to fail, or nears a critical failure, that sound or vibration will begin to change or fluctuate in a way that users will not be able to detect. Using machine learning we believe we can detect these fluctuations and alert users before a catastrophic failure happens and schedule preventative maintenance. On Friday we presented our work at Amazon (see photo below). The audience was our fellow workshop attendees, organizers, and external representatives (NIST, University of Washington, etc). The top proposals will be selected to attend (and pitch their idea) in Washington D.C. in July. We think our proposal was strong, but we should hear soon! Overall, my experience at the workshop was fantastic. Even though the focus of the conference wasn’t my main area of research, I greatly benefited from the talks and presentations on Monday, and the atmosphere during the week. What’s more — our group will be submitting an NSF proposal to further research our idea. Unfortunately I won’t have time to contribute but I wish them the best of luck in applying, and I hope to keep in touch. If you like someone’s talk, go tell them! This is a great way to meet to new people. The only way to have good ideas is to have lots of ideas — we went through at least four or five ideas before we finalized on a project.